This year's Miss Universe winner Catriona Gray, from the Philippines, was crowned on Monday (Dec 17). But who won the national costume segment? Singapore did not, but Laos did. The Straits Times rounds up 10 of the best and most interesting costumes. The Laos' representative On-anong Homsombath wowed audiences when she took the stage with her extremely detailed costume, which made it look as if there were three figures walking in a straight line. According to reports, the figures were inspired by the Kinnaree, which are half-bird, half-woman creatures in South-east Asian mythology. The costume, mostly gold in colour, looked difficult to manoeuvre, but definitely left its mark on the judges, who rewarded the effort with the top costume prize. The Spanish representative Angela Ponce made headlines as the first transgender contestant in Miss Universe's 66-year history. Her costume was also newsworthy, as she portrayed a flamenco dancer, with hints of red on her headpiece, fan, and dress bodice that contrasted sharply against the pure whiteness of the rest of the costume. The "Queen of the Maple Leaf", Miss Canada, walked onto the stage in an elaborate gown and headdress that paid homage to her country's symbol and history. While the dress looked heavy, Ms Marta Stepien wore it with a wide smile. The interesting use of red and gold circles at the edges of the costume, and what appeared to be a fan-shaped maple leaf-themed accessory, were highlights of the costume. Miss Kiara Ortega's costume had three pairs of hands that extended from her back, and was topped off with a huge silver star headpiece. Her costume was said to be a representation of the people of Puerto Rico, rebounding after the devastation of Hurricane Maria in 2017. In her hands she held a white sphere, signifying the archipelago's rise to become a pearl of the Caribbean. The Philippines didn't just win the whole pageant; they also shone in the national costume category. 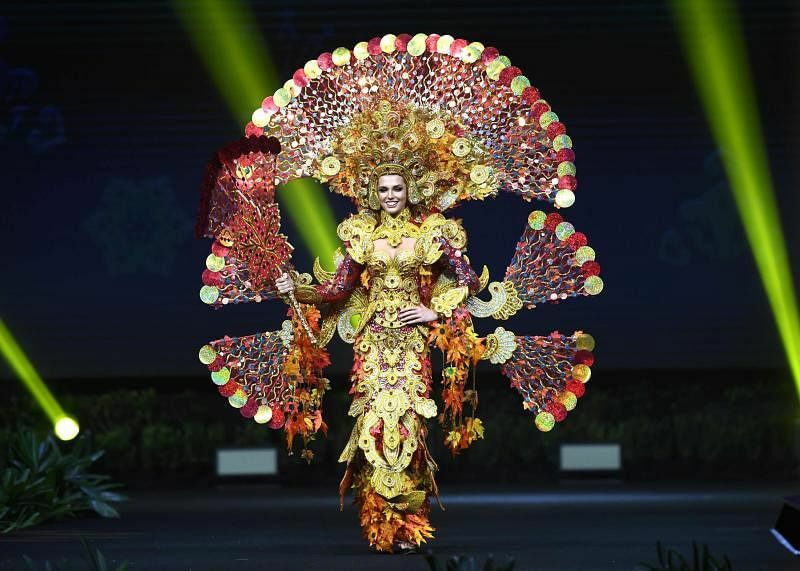 Ms Catriona Gray's costume was inspired by the Luzviminda, which is a portmanteau of the names of three major Philippine island groups - Luzon, Visayas, and Mindanao. The costume includes a stunning brass headpiece and customised footwear embroidered with indigenous textile patterns. Designed by stylist Theer Phasuk, Miss Thailand's national costume represented the importance of elephants in Thailand's history. Apart from the elephant head and trunk, that were made of a shimmery fabric, the outfit also features a traditional Thai gown. The white and gold accents on the costume were a classy and elegant touch. 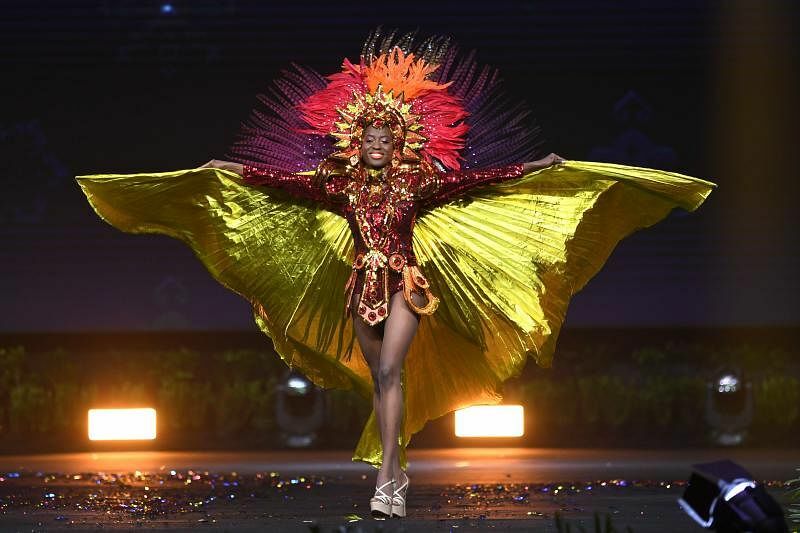 Haiti's costume, donned by Ms Samantha Colas, was a colourful masterpiece of warm tones. The main costume was in a shade of dark red, and was accompanied by a bright and fiery red and orange feathered headdress, and a large gold cape. 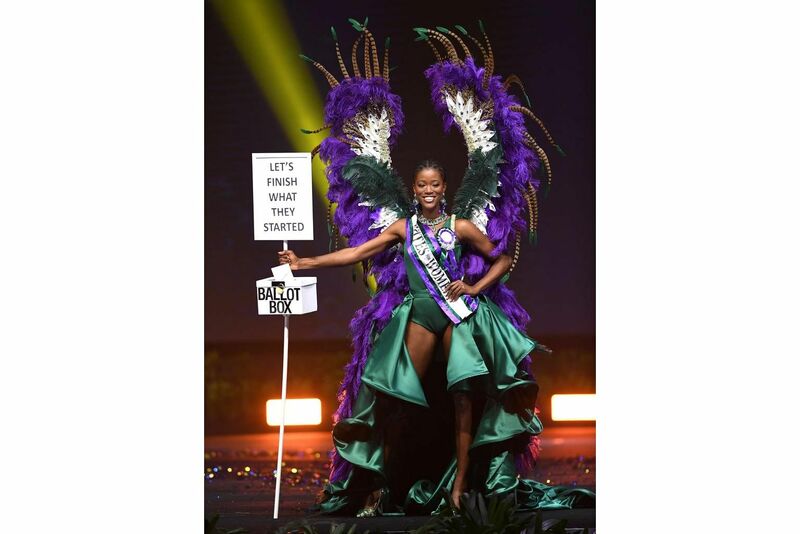 Some might have been confused by Ms Great Britain's hand-held accessory for her national costume, which was a ballot box and a sign that said: "Let's finish what they started". But there was a serious message behind it. The costume was meant to represent the suffragettes and mark a centenary since British women first voted in a general election. Her dress was also a gorgeous emerald green, with purple feathers to match. The French representative was proudly styled in her national flag colours - blue, red and white. She wore a shiny blue bikini that had three strips of tulle-style fabric in the different colours as an attached train. The recent French football victory at the World Cup 2018 was also represented in the costume, as her shoulders were adorned with two small football-patterned pieces. Miss Ecuador's costume was a stunner as she walked along the stage, bursting with colour that only seemed to brighten as glittery confetti surrounded her. Her costume highlighted the flora and fauna of the Amazon, with what looked like wings along her side that were brilliantly bedazzled, and the head of a bird to cap off her look.